If you missed my article on the Facebook data breach that resulted in hackers being able to access your account without your password, see When Your Friend is Not Your Friend for background. Let's move on to our discussion of how an authentication app can add an extra layer of security to your online accounts. An authentication app provides the second factor in a two-factor authentication (2FA) log-in system. The most widely used authenticator is a standard SMS text message delivered to a device presumed to be in your possession. If you correctly enter the six-digit code included in such a text message, the server believes you are who your username and password claim you are. Google Authenticator (hereafter, simply “Authenticator”) is a far more secure implementation of two Internet Engineering Task Force standards: RFC 6238 and RFC 4226. As such, Authenticator works with any server software that also conforms to the standards. Authenticator is available for Android, iOS, and Blackberry devices. Authenticator is not limited to Google accounts such as Gmail, Drive and Youtube. It can be used to secure your accounts with Facebook, Microsoft, Dropbox, Amazon, WordPress, and many other online services. See TwoFactorAuth.org/ for a long list of websites that support Two-Factor Authentication. The really cool thing about using a two-factor authentication app is that even if a malicious person has your username and password, they cannot login to your account! And no, using Google Authenticator does not give Google access to any of the accounts you use it with. If you prefer to use a non-Google authentication app, check our Authy or the Lastpass Authenticator. How Do Authenticator Apps Protect You? Authenticator, Authy and similar apps provide a six- to eight-character one-time password which a user must enter in addition to their username and password in order to access a Google Account, log in to Google services such as Gmail and YouTube, or log into any other online service that uses compatible 2FA algorithms. Alternatively, Authenticator can pass its codes to third-party password managers such as Dashlane, making the act of logging in nearly effortless as far as the user is concerned. Another alternative is a QR code that can be read from your device’s display; I have not tried that method. The connection between Authenticator and the challenging server is protected end-to-end with 128- or 160-bit encryption. The code changes every 30 seconds, and is not confined to one million combinations of ten primary digits, so it is not practical to crack the code by brute force. Combined with a password manager’s very long and very random passwords, Authenticator provides the most formidable software-based security available. Only a dedicated hardware key, such as a YubiKey, is better. The latest Facebook security fiasco could not have happened if everyone was required to use an authentication app. The standards call for one-time passwords, so there would have been no database of reusable access tokens for thieves to steal. Most recent comments on "[LOCKDOWN] How Authenticator Apps Protect Your Accounts"
The problem with this is simply the word 'presumed'. What happens if the only device I have on me is my phone? Or my Ipad? I'm sorry, but the last thing I need is yet another complication to my life. This is fine for people who stay at home. If you travel extensively like we do, even the current 2 step authentication is a real pain. We are not able to get international services on our mobile phone, so when we travel, these things are a real pain. "I urge you to use an authenticator app on every service that supports it." And, how do I know which services support it? I use device ID a lot instead of TFA, do you think this is as secure as TFA? 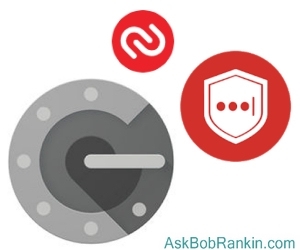 Bob, Why don't you recommend some of the many open source password managers. Some are even free. Many people feel safer with something open sourced than proprietary. John, he does recommend them...often. I use Authenticator and it does add a level of hassle, but the added security makes it worth it. I also use Dashlane to manage my passwords and payments. Beats the heck out of just using the password for every account as I had been known to do many years ago. Not that it ever cause me any problems- there are billions of us out there you know. I'm pretty dense, I admit. I'd like to know if you need a separate Authenticator (Google dongle, whatever) for each device. Or is it an app? Or what? I ask because, right at this moment, I'm sitting with three laptops running in a quarter-circle around me. A fourth (my old emergency go-to) is on a desk six feet away. Within reach are three smartphones and a flip-phone connected to phone companies, as well as the Internet. One more smartphone is Internet-connected (no phone subscription). How many authenticators do I need and how long would it take me to do "things" on all of these? I am a senior citizen who is active in many ways. I do a lot on my computer at home. I have a 2" thick binder full of sites that I use and the myriad of passwords that I use. I never use the same password for more than one site. The authenticator seems to be pretty neat, but it may be a pain to use a dozen or more times per day. I've thought about a password manager, but where should or can I keep it with all of those passwords, on my cell phone, or on a thumb drive? I would go for a thumb drive. Cell phones are subject to all kinds of problems (stolen, dropped, dunked in the toilet, etc). Thumb drives are much cheaper, easy to duplicate and smaller than that 2" binder. Just put a tag on it marked "VIRUS" and a normal person woun't try to look at it.